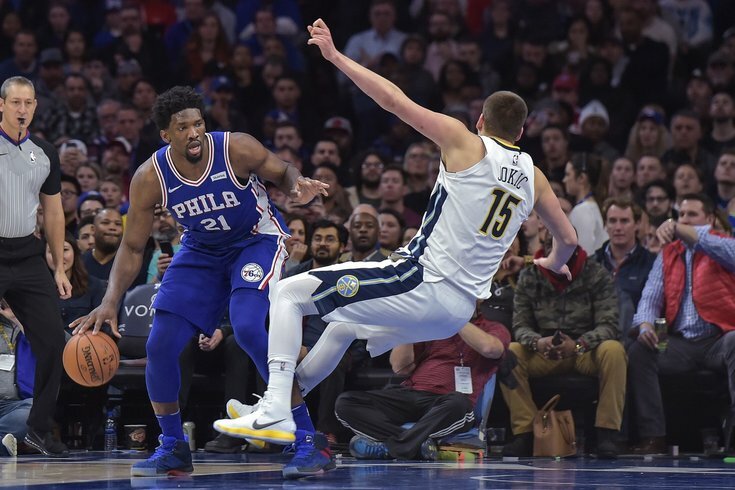 Denver Nuggets center Nikola Jokic is fouled by Philadelphia 76ers center Joel Embiid during the third quarter of the game at the Wells Fargo Center. The Philadelphia 76ers won the game 123-104. From a Sixers perspective, most people who follow the team have set their attention on the Rookie of the Year race, thanks to a hotly-debated battle between Ben Simmons and Utah's Donovan Mitchell. There's little to suggest the two are in the same weight class as players, but it has dominated conversation all the same. The focus on Simmons' case has taken focus off of some of the other top honors around the league this season, which is a shame when you consider how Philadelphia factors into the broader discussion. With 50+ wins and homecourt advantage in the first round of the playoffs, the Sixers are no longer the plucky upstarts they were viewed as last season. They're a legitimate threat in the Eastern Conference, and a squad most opponents are hoping to avoid in the early rounds. Their legitimacy as a team has raised the profile of some of Philadelphia's top players, who have real chances at some of the most coveted individual honors the league has to offer. So with that in mind, even without an official ballot, I thought I'd dive into some of the races involving Sixers personnel this season. So let's get down to business. As a rule of thumb — games played is a "metric" that matters to me, but is not the end-all, be-all it is for some voters. When players are demonstratively better or more impactful than their peers in similar samples, I will take the guy who is more influential in wins rather than the guy who was simply available more. And this is perhaps more important — defense matters. I have some conflicted feelings about this award, because counting the wins a team had is not a compelling argument on its own. Team success is and should be a big part of the equation, but players in the league's top echelon have to deal with voter fatigue and narrative-based thinking that punishes stalwarts like LeBron. Being consistently great doesn't afford for a great story to sell. But while my reflex is to default to a player like James — or even Kawhi Leonard for his two-way excellence last season — I think Harden's body of work in 2017-18 makes him the clear favorite, and his combination of statistical dominance and team success earns him the award. The argument for James is, in part, the same argument for Harden. As the leaders of their respective teams, they shoulder a unique burden to make sure everything around them falls in place, whether that's the team's play on the court or the harmony off it. While LeBron has done this over the last couple months of the season following a busy trade deadline, Harden did this from day one, accommodating another dominant ballhandler into the fold and transforming Houston into the league's best regular-season team. Does LeBron deserve to be punished for his team acquiring Isaiah Thomas instead of Chris Paul? Certainly not. But Cleveland's defensive woes can be attributed at least in part to LeBron's in-and-out effort on that end. Harden isn't exactly Tony Allen, but by caring a bit more about D, his otherworldly contributions on offense can be appreciated like they should. The other names are fairly obvious choices up until Embiid, who a lot of people will ding compared to his peers for missing the final stretch of the season. But make no mistake — the Sixers do not have the platform to go on that long win streak to end the season if Embiid doesn't lay the foundation first. He single-handedly kept them in or won them a lot of games before the team got a bench that made sense, and has been one of the league's best two-way players all season. This was an agonizing decision, but I think you ultimately have to give this award to Gobert for his outright dominance during the time he played. It's a two-man race and both guys should get first-place votes, but Gobert was marginally better in a comparable amount of games. There are lots of good-to-great defenders in the NBA, but Embiid and Gobert are two of the only guys who are transformative by themselves, one-man wrecking crews who tilt the floor for opponents. They are so imposing at the rim and so capable of deterring jump shooters on switches that they end up forcing teams into a lot of undesirable mid-range shots. In terms of protecting the rim, Embiid was arguably the better player during their time on their floor this season. His DFG% at the rim was among the best in basketball, a few full percentage points better than Gobert's. But in a lot of the major stat categories, Gobert emerged on top, besting Embiid in Defensive Win Shares, Defensive Box Plus-Minus, Defensive Real Plus-Minus — where he's the leader by almost a full point per 100 possessions — and simpler measures like blocked shots. The Jazz ended the year with a better defense than the Sixers, and it is largely because of the efforts of Gobert, despite Embiid having Robert Covington and Ben Simmons helping him turn the Sixers into an elite unit. These two are going to battle for top honors for years to come as long as they're both healthy, and their efforts on that end are among my favorite things to watch in the league. This race is not at all close for me, and I believe Mitchell is much closer to the third guy on this ballot than he is to Simmons. That we are debating the definition of a rookie rather than the standard set by their play is telling for me — it shows the only case for Mitchell is one in which Simmons is disqualified. But you know this, because you read my piece from the other day. Simmons will likely win the award, which says more about him than it does about the excellent seasons Mitchell and Tatum had. Oladipo might win this award unanimously, and he would deserve to. The Clips faded down the stretch, but this is another easy one. After Defensive Player of the Year, this is probably the most difficult race to settle on a winner for. There are success stories all around the league, from Toronto's Dwane Casey revamping their offense to Indiana's Nate McMillan taking a team many wrote off to the playoffs. I think there are 5-7 legitimate candidates, and leaving Gregg Popovich off this ballot feels like a crime against basketball. But I think there are three clear cases for the men above as standouts. Stevens earns the top honor because if you had told most people Gordon Hayward would have gone down on opening night, few fans or experts would have expected the Celtics to succeed to the degree they have. He has coaxed the best out of young players like Jayson Tatum and Jaylen Brown, and maintained an elite defense with top contributors in and out of the lineup all season. Stevens is flexible, a smart tactician, and one of Boston's biggest reasons to feel hopeful in a playoff series. D'Antoni makes the list for similar but very different reasons. A lot of the credit belongs to the star players for buying in, but absorbing a ball-dominant player who traditionally has played a slower, more methodical pace and continuing to fire on all cylinders is not as easy as it looks. He has pushed the right buttons in the rotation, leaning heavy on bigger wings and defensive-minded shooters to surround Harden and Chris Paul, and slowly minimizing players like Ryan Anderson in preparation for a battle with the Golden State Warriors. And then of course there is Brown, who has helped lead the Sixers to the best two-season turnaround in NBA history. The Sixers have succeeded despite their two best players thriving in styles that are the exact inverse of one another, and Brown's navigation of that dynamic has been underappreciated all season. Getting this team to 52 wins is quite a feat, even if it doesn't rank at the top of the list for jobs done this season. Apologies to Casey, who appears to be the favorite, for not being overly impressed that he finally figured out his Toronto team should shoot more threes. Giving a coach credit because their offensive philosophy has been plainly archaic in past years is not something I'm down with. The same logic for Gobert over Embiid holds here. And yes, you're not misreading that — I think there are three Sixers players who deserve to be on All-Defense teams this season. By almost any measure, Covington has been one of the best and most impactful defenders in the league this season. On a given night he is often checking the toughest assignment an opponent has to offer, whether that's a shifty guard in Kemba Walker or a burly forward like LeBron James. Philadelphia's switch-heavy scheme does not work without him, as his work away from the ball is just as important, if not more important than his one-on-one defending. In Embiid's absence, he stepped up as an even more vocal leader, organizing things on the back end for a team missing their anchor. The metrics love Covington too. He's top-five in the league in DRPM, the league leader in deflections among regular rotation players, and worth every bit of that extension he signed earlier this season. There is a case to be made for Simmons on the first team as well, but I think Covington does more to hide for some of Simmons' (very small) limitations than the other way around. When there's a shifty point guard the Sixers don't want Simmons to have to chase around, like Kemba Walker, it's Covington who has to take on the assignment. Some of that is simply cutting down on two-way burden for Simmons, but it's worth considering. That said, Simmons' versatility on the defensive end has been mind-boggling in his rookie season. He's the only player in the NBA who spent 20+ percent of the time guarding every position from point guard through power forward, and he ranks high in steals and deflections along with Covington. Simmons managed this without the usual overzealousness of a rookie player, producing turnovers without having to over gamble that often. Simmons may not be a scheme changer like Embiid, but his combination of size and athleticism opens up possibilities other guards simply don't. Once again, Embiid's battle and the case for a top spot is compelling, and I think given the team's success with him on the floor, there's no reason to feel bad for putting him on the first team if that's your preference. However, the job Anthony Davis did to drag New Orleans to the playoffs was nothing short of spectacular after losing DeMarcus Cousins to injury. Though he played forward next to Cousins a lot of the year, he played center enough that I think flexibility is warranted to get him on the first team. Most of the names on this list are obvious until you get to the third team. Curry will be left off of some ballots because he has played comparatively few games compared to his competitors, but Golden State's play in his absence should show you just how valuable he is even on a team filled with stars. Truthfully, I thought long and hard about putting him on the second team over Westbrook, but the gap in games played is too great given that both of them offered elite production while they were on the floor. I also bent the rules (and my own positional designations) a little bit to get both Butler and Simmons on one of the All-NBA teams this season. The former was Minnesota's engine all year, only derailed temporarily by injury, and an annual leader of players who play balls to the wall every single time they step on the floor. Yes, Butler offered elite production, but he also gets credit for being the tone-setter for a franchise finally returning to the playoffs after a long absence. The real crime of the Rookie of the Year "race" is that we've spent so much time comparing Simmons to other rookies, instead of Simmons to the game's top players. In year one, he put up stats only managed by some of the game's great players, while offering a defensive versatility and production level matched by very few players in the league. Without the closing stretch, he probably would have been on the outside looking in in favor of Paul George, but putting the team on his shoulders and playing his best stretch all year when it mattered most was the cherry on top. Second team: Bam Adebayo, OG Anunoby, Bogdan Bogdanovic, Lonzo Ball, Dennis Smith Jr.
For once, it was not pulling teeth to think of the second team of rookie players who deserved this honor. Markelle Fultz remains on the outside looking in after one of the weirdest seasons for a young player in recent memory, but expect the youngest player in the class to reassert himself in the mix after a full offseason.